What’s a Supertaster, you ask? Well, I hate to brag, but that would be me. I’m a supertaster. It’s kind of like being Wonder Woman without the warrior princess gadgets. My super powers are in my taste buds, not in indestructible click-click bracelets or projectile tiaras. Okay, I’ll be honest. It’s not that big of a deal—25% of us are supertasters. We’ve inherited a higher-than-normal number of taste buds and are typically more sensitive to strong, bitter foods. Think raw broccoli, Brussels sprouts, cauliflower, cabbage, grapefruit juice, whiskey, wine, dark chocolate, coffee. We don’t like those foods. Although I have the supertaster genotype, I do like (have come to like) all those choices with the exception of whiskey. I’ll get to that in a minute, but first, let’s take a brief look at the genetics behind food dislikes—or variations of that theme. 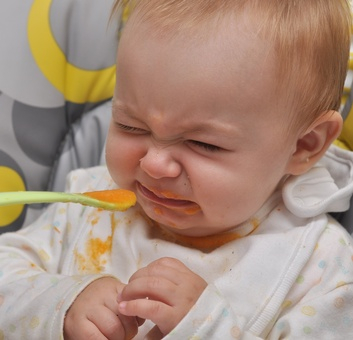 Maybe your kid is a “picky eater” for a reason. Supertaster’s have cell proteins on their tongues that detect intense, bitter flavors. All genes encode proteins with information from our DNA. I happen to have the gene that is the protein blueprint for an overwhelmingly bitter taste. But what makes all this interesting is the mix of our genes and our personal and environmental variations. I’ve managed to override some of my genetically predisposed, taste quirkiness by tweaking the quality of the food. That, and my willingness to experiment. Some of these bitter foods are incredibly healthy and contain cancer-protective substances, so broccoli, cauliflower, cabbage, and Brussels sprouts have become favorites of mine. That’s my phenotype at work. I haven’t turned the gene off, I’ve simply tweaked the stimulus (my food environment) in a positive way to pull a fast one on my supertaster gene. Let’s take this one step further. By purchasing high quality versions of these foods (fresh, organic) and taking the time to prepare them in a way that accentuates the flavors I that I do like, I end up supplying my body with phytonutrients (plant chemicals) that promote good health. That way, I can get my foot (phytonutrient) in the door (cell) to turn certain other genes off or on. I can discourage disease-promoting genes and encourage health-warrior genes. We have the power to do that. Back to supertaster foods. I don’t like raw broccoli, cabbage, or cauliflower, but I do like all those vegetables drizzled with a small amount of olive oil, dusted with Simply Organic All-Purpose Seasoning, sprinkled with sea salt and freshly ground pepper, and lightly roasted. I don’t like most types of coffee (Starbucks is over-the-top bitter to me) or most types of wine, but I do like my mellow, organic, breakfast blend coffee mixed with a little coconut milk and I love having a glass of nice, smooth red wine. But, a lot of wine does taste bitter and acidic to me, to the point that I literally turn up my nose and shiver. There are only a few dark chocolates that I like and I much prefer them topped with a little sea salt. Grapefruit juice I can totally do without. I’m also a salt-aholic, but only with good quality sea salt. Salt masks bitterness, so it makes sense that supertasters are heavy-handed with the salt grinder. Are you wondering how I know I’m a supertaster? I took the test. Researchers have discovered a chemical that, when applied to a strip of paper and placed on the tongue, distinguishes between non-tasters, medium-tasters, and super-tasters. I ordered the test strips and was overwhelmed by the bitter taste. Seriously bitter. I actually thought I’d be a non- or medium-taster because I like most of the foods on the list, but after the test and some thought, I realized that I’ve simply adjusted to being a supertaster. I had a couple of other people take the test and they had absolutely no reaction. None. They didn’t taste anything. I couldn’t believe it as I could hardly stand the taste. Apparently supertasters experience flavors with about three times the intensity of others. Why do you think some people are supertasters? Is that an evolutionary advantage or a disadvantage? Say you’re out doing some gathering during the Paleolithic era and you grab a handful of leaves. You take a bite, find the leaves extremely unpleasant, nasty-tasting and bitter, so you spit them out. Maybe you just saved yourself from an untimely death due to ingesting toxic plant chemicals. Good one. I’m glad I’m a supertaster. But wait, food was scarce back then. You can’t be picky. My non-taster neighbor will eat anything, therefore having more chance of survival when times are tough. What’s your theory? Are you a supertaster? Is that good or bad? While you think about it, here’s a recipe for roasted broccoli and cauliflower. 2. Place florets in a medium bowl, drizzle with olive oil and toss to cover. Sprinkle with herb seasoning, sea salt, and pepper. Toss again. 3. Place florets in a shallow baking dish and sprinkled with garlic. 4. Place baking dish on the center rack of oven and roast for about 25 to 30 minutes, or until lightly browned. Stir occasionally to insure even browning. Note: Broccoli stalks are wonderful roasted. All these foods are almost undetectable used raw in small amounts blended into smoothies. Okay, what do you think? I’m curious. What’s the point of the supertaster gene? Did it evolve as a protective mechanism or was it a detriment to survival? Peace, love and the wonderful world of genetics! This entry was posted on Thursday, February 9th, 2012 at 10:58 am	and is filed under Miscellaneous, Nutrition Therapy, Super Foods. You can follow any responses to this entry through the RSS 2.0 feed. You can leave a response, or trackback from your own site. OMG, I’m a supertaster and didn’t know it! I have HUGE issues with bitter. It’s my main problem with foods like kale. I can detect kale in anything! I also can’t eat raw broccoli (or other raw cruciferous), but adore them (seriously, can’t get enough) cooked. I don’t like wine, chocolate, or coffee either (and don’t even get me started on something like whiskey! ), all too bitter for me. Okay, I eat chocolate, but only for the sugar really. Truth be told, I’d eat white chocolate every day of the week over dark. I even have issues with some of the more bitter greens cooked (and can’t tolerate cold salads with bitter greens), but have learned that just a wee bit of honey does wonders to take away the bite of them in cooking. I was blown away when I did this test. The test strip was soooo bitter I could hardly stand it. Others couldn’t even taste it. My husband had no response at all. NONE. I literally couldn’t believe it. Whiskey is just disgusting. I do like wine, but I’m sooo picky about which wine I drink. I taste a very bitter, acidic taste in most wines. Same with coffee and dark chocolate. Arugula is very bitter. It’s interesting, isn’t it?! I once tried arugula in a smoothie and that was the only time I had to throw a smoothie away. I can only do spinach or romaine in smoothies, and even then, I try to use stronger flavors in the mix because I can even taste spinach a little and can definitely detect the bitter notes of romaine. I also only like spinach and regular greens in cold salads – all hearty greens and other veggies I have to cook or it’s a no go. I don’t even think I need to take that test, I have such a sensitivity to bitter! Honestly, I only drink wine to be social with girlfriends, but NEVER touch the stuff otherwise because I just don’t like the taste. Obviously, I’m immensely fascinated by this! I thought I was going insane when I would taste something and no one agreed with me that it was bitter. Put cinnamon in your smoothies. It cuts the bitter taste. Also celery tastes salty to me and also cuts the bitter taste of certain greens — add celery to smoothies. It’s interesting, isn’t it. Quirky genes! Like I said on FB, you always educate me and crack me up at the same time, and I love that! Wonder Woman consideration aside, I’m dying to know where I fall in the supertaster spectrum. I think somewhere in the middle, so no super hero accessories. Sigh. I think I’ve always loved chocolate. A lot of the bitter stuff you’ve mentioned I’ve learned to like, but the olive oil and seasonings are key. Love the simple recipe, too, Melissa. I checked out the ingredients in the seasoning and I can totally see why you’d love it and use it often. Thanks, Shirley! I appreciate your kind words. For some odd reason, I find humor in most of the research I read. Science is incredibly entertaining. =) And yes, that seasoning is an absolute favorite of mine. And it smells divine! I am a supertaster too!!! I got tested in college. But I do like those foods, although I find them so overwhelming that I can’t eat much of them, or much often. I’m very picky with all of them. I think sorghum has phenyltiocarbamide as well, because it tastes so bitter to me that I have to be careful how much I use it, and in which proportion (usually, I use a sorghum, tapioca and MILLET mix for bread). Anything short than millet and I taste too much bitterness. Interesting that you were tested in college! In a science class? Also, I find millet a bit bitter as well. Some of those stronger-tasting grains need to be adding into a blend of flours to cut the taste. Just as you suggest! Thanks for your comment. I appreciate it. Do you know that baby-taster?! I know I am a supertaster. I always notice the sligthest change in food. I have a family of supertasters. We get around it by going for what is good–and adding in like you do–flavors to compliment. I think it is good thing. I know it has saved me from eating things that would have harmed me. I’m guessing you are a supertaster if you have a family of them. Genes do run in families! =) You’re right about adding in flavors that compliment the bitter taste. Thanks for your comment. I appreciate you adding to the conversation! Thanks for commenting Heather. Interesting that you took the test in highschool? Biology class? Those foods (cruciferous vegetables) are filled with health-promoting goodness, so it’s great to try ways to incorporate them into your diet. In changing to Paleo and trying to incorporate more veggies which I’ve always disliked I keep trying things but they taste atrosicious. Bitter, metal tasting. Where did you get the test from?? It sounds like me. Erin, Metal tasting? Interesting. That’s what xanthan gum tastes like to me. I don’t use it, but it’s part of gluten free cooking and for a variety of reasons, I avoid it. But now that you mention “metal” — that’s the taste! Thanks! =) I ordered the test from the supertaster website. I did it awhile ago, but as I recall, it wasn’t expensive at all. Maybe a few dollars for several strips. Fascinating! I would love to take the test as well, though I strongly suspect I’m a middle-of-the road taster. I like just about everything though Scotch makes me shudder. Oh, and I don’t love broccoli rabe. But all the other greens, especially when enhanced, are high on my list. Hmmm, good food for thought. Thanks, Ellen! Yes, I thought the whole experiment was rather fascinating as well. Scotch? Ewww, I can’t even smell the stuff. “Shudder” is a perfect way to describe it. Verrry cool Melissa! I wonder if I’m a supertaster? I don’t mind raw broccoli, so probably not. I’m probably just a super picky taster. Being a super picky taster is a good thing. As long as it’s for healthy food. =) You should do the test on camera, for the first time! Seriously. i’m definitely going to get the kit. SO curious! thanks for a great post! Oh how I love thee! You had my taste buds going crazy. I was salivating, turning up my nose, nodding my head! All in one brief but incredibly education post! I think I’m a supertaster! You have such a way with words! And, you probably are a supertaster, but one with a bunch of cooking tricks up her sleeve to make bitter taste wonderful! What an interesting test… wonder if the UK has such a thing, I’ll try to find out. Something tells me I’ll be a supertaster too. Is it not true that the bitter tasting foods are liver stimulants and that some bitterness is a good thing? I watch as friends tuck into mountains of thick cut marmalade which is sweet and very bitter sometimes. I prefer a fruity milder type so I make it myself. I do love my bitter cherry tree though and found a bag of these frozen beauties recently… being not too sure if they were still good to eat I tried one and it tasted fine so I made a small quantity of jam with them… sweet and sour, that’s more like it. My father hates all onions and tomatoes… now that’s more unusual around here. I’d say he was a keen eater of most everything else but unfortunately for him these two vegetables are in a lot of dishes in one form or another. I often wonder why people feel the the way they do about the vast array of foods available, sometimes choosing a very limited diet. Very interesting stuff Melissa, as usual you’re tackling the subjects the rest of us are anxious to know about. Let me know how things are going with you and yours…. I must do the same. Incidentally the salty dark chocolate someone sent me once is still my favourite compared to all those I’ve tried over the years… good taste some of my friends have! I wouldn’t be surprised if you tested positive as well. Let me know if you find the test. It’s not expensive if you do the taste test. They also have a genetic test, but hardly worth the expense. Some of the bitter foods are soooo healthy that it’s good to figure out a way to cook them to bring out the wonderful taste and inhibit the bitter. Does your father dislike tomatoes because of the texture or the taste? That is interesting. As for salt and dark chocolate, we like the same version! I’ll be in touch! Thanks for hanging in here with me. I’m always delighted when you stop by. =) Sending love across the pond. This totally explains why my siblings and my kids and I just love broccoli and Brussels sprouts and kale. It also explains why people are so divided over my very tart kale and cranberry smoothie. It must be wretched for super tasters, while the rest of us without taste happily chug it down. I was considered a picky eater in my childhood because I refused to eat liver and hated fat and skin on meat, but I always ate my veggies. This puts a lot of things into perspective. I thought I had used kale (and cranberries for that matter) in every way possible, but I have yet to mix them together in a smoothie. I did create a kale and cranberry salad that I love, but haven’t blended them. I love my veggies too and am not fond of fat and skin on meat either. In fact, I’m not all that fond of meat and rarely eat it. Veggies are my mainstay, that’s for sure. Okay, off to try a kale and cranberry smoothie. Thanks! I got my test strip on Saturday and I am officially a “normal” taster. Glad something about me is normal! PS Who wants to be normal anyway?! We did a test suggested by a science web site, it involved straining a section of your tongue blue with food dye then counting the dots and comparing the results to a panel of photos. I don’t know how accurate it was, but it was fun! Btw, I’m a super taster too, but have learnt to eat and enjoy a lot of the bitter foods. I think I appreciate them on a different level, I used to loathe them indeed! Fascinating. I’m in the midst of eating roasted beets, cauliflower, and broccoli stalks for breakfast right now, so I actually don’t get it. I’m a supertaster (the test strip was SUPER bitter), but have no problem eating these supposedly bitter foods. I tamper with them though. =) Herbs, spices, salt (I’m big on fresh ground sea salt), and fresh ground pepper. It’s interesting. Thanks for weighing in with a whole new twist to the conversation! !